Does 'lucky in love' really exist? 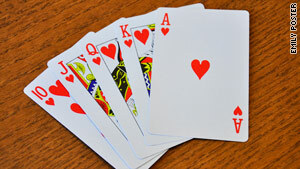 There are ways to improve your luck when you gamble on love, author says. (The Frisky) -- We all know a woman who seems to be more fortunate in the guy department than the rest of us. For me, it's my friend Anne. She moved to New York right after college, got a job, and, there, she met Paul, a sweet mountain-man type who -- by pure coincidence -- was from her East Coast hometown, had attended her smallish state university, shared several of her friends, and enjoyed her favorite outdoorsy activities. Four years later, they're still happily together and living in a quaint one-bedroom apartment in Brooklyn. "It was all meant to be!" she told me over drinks. "Everything happens for a reason." Theirs is a great story, no question, but I couldn't get on board with her theory that fate had a hand in the matter. The way I figured it, she was probably just really, really lucky. Because if everyone is fated to have an amazing love life, wouldn't we all be dating Ryan Gosling right now? "It is totally fate," says Kate, 29. "I met my husband on a plane from Boston to New York. The flight had been cancelled and rescheduled three times, and I was drunk as a skunk from nervousness about flying. I made him hold my hand for the landing, and then we shared a cab and went out for a drink in the East Village afterward." "I know more girls who are consistently unlucky than lucky," says Erin, 29. "Some of us make smarter decisions than others; however, some very earnest and well-intentioned lady friends of mine seem to never win -- like myself. Overall I really do have great memories of most relationships. I think the universe just didn't have it in the stars for some reason or another." Chances are, you already know a few key principles that'll increase your odds of building a solid relationship, like stepping outside your apartment regularly or, say, not dating John Mayer. But beyond that, some of us need an extra cosmic push, which is where a little bit of luck could help. We scoured the country and asked love experts whether luck in love really exists -- and how you can skew the magnetic pulls of the universe in your favor. Before you read on, though, you've got to ask yourself one question: Do I feel lucky? Well, do you? Does luck in love really exist? "I believe luck is tied to what you build up in past lives and what you bring into this life. What we perceive as being lucky right now may not actually be from this life -- it may be from something they earned. So, luck is a focus of earning a gift in this life, and then having the free will to do with it what you will. You could still screw it up, technically." How can you increase your luck in love? Never act out of fear. "The secret is to stay open to meeting people and what's to come to you. Be in the moment. Desperation is fear. People who go out and date randomly: That's a little bit of fear, don't you think? The universe is about being open to your opportunities so you recognize them." Stop online dating. "Never join a dating service. What the hell are you doing? I just think it's stupid. I think it's lazy. If you're in a working environment, a medical environment, a home environment, wherever you are, you can meet people. And if you're having trouble meeting people, you need to teach yourself how to be more open to communicate with people." "I don't know that my research could answer that, but engaging in other rewarding activities and other rewarding relationships [other than the dating scene] may help. By being happy and satisfied in their lives, people may attract a mate in that way." If you're already coupled, embark on a challenge with your partner. "There's a series of studies that indicate that engaging in novel and challenging activities increases feelings of romantic love. What that means depends on the couple: If you're not the outdoorsy type, go on a hike, or even taking a walk in the woods could seem like something new and somewhat challenging." "I don't believe in luck. Luck implies something is random, and I don't think anything in life is random. There are ways we can use a blueprint. There are ways we can deliberately enhance our surroundings to create the life we want to have." Decorate your home with pairs of items. "Ladies, go through your space and notice what images or items you have on display that depict single items: pictures of one person, one cat. If you have one candle, put another next to it. If you're a single mother, start to pair up the toys. If you have a painting with a single image, you want one with two images. Go to an art web site and type in 'pair' or 'couple.' This creates a template to your brain that says 'pair = good.' "
Set up your "partnership" corner. "Get a compass and find the southwest direction of your space. That area is associated with partnership. In traditional feng shui, the way to energize the southwest is with pairs of things made of earth: rock, stone, cement, pebbles. Rose quartz is associated with love, so that's a traditional, nice thing to add." "Luck is just another word for variance. You can have good luck, which is positive variance from expectations, or bad luck, which is simply negative variance from expectations. I don't believe in 'being lucky,' per se. Although I will say that oftentimes when people are getting lucky or running well (in poker, life, or even love), they're in a good mood, which in turn helps sow the seeds for more good things to happen for them, which can make them seem like a lucky person. That's why good things generally happen for positive people. It's also the danger in being a pessimistic or negative person: When things aren't going well and you let it get to you, you actually breed further detriment to yourself by being negative, which can cloud your judgment and affect how/whether others want to be around you." Read your date to gauge his honesty. "People move their feet when they are uncomfortable, or being dishonest. This is rooted in the primal urge to 'fight or flight' when we sense danger. Since someone who is lying subconsciously senses a danger of being caught, their instincts kick in and their foot may move. This phenomenon occurs instinctually, and most people aren't aware that they do it." "Luck is really preparation meeting opportunity. What does it mean to be prepared? Knowing one's self very well. Go out and do things: explore, experiment, have fun, let loose, and be yourself (even if being yourself means holing up in the physics section of a bookstore). The other part of the equation is opportunity. Create opportunities to meet people. That could mean taking a yoga class, attending your niece's baptism, learning to make sushi, signing up for a tour of Indonesia. Make plans with those in your social circle regularly, and honor those commitments." Make yourself scarce. "Certain regions of the brain related to pleasure light up in the face of unexpected rewards, which, practically speaking, might serve as advice to young women to make themselves 'unavailable' on occasion -- ideally, due to a rich and rewarding life -- so that when they do become available, their presence and company serve as an unexpected and pleasant surprise." "I don't really believe in luck. I'm very into psychology and very much into energy. We all vibrate at different frequencies. People are born into different family situations, and they take a lot of patterns from those relationships with their families, and they act it out in adulthood. We need to be conscious and focused about it so we can make different choices." Change your focus. "We say 'I don't want someone who doesn't have a job or isn't available to me,' et cetera. What we should be focusing on is what we do want. Keep talking about it, and keep visualizing it, and when you do, you start to feel it. You're changing what you're putting out, and it comes back to you. We all consist of kismet."